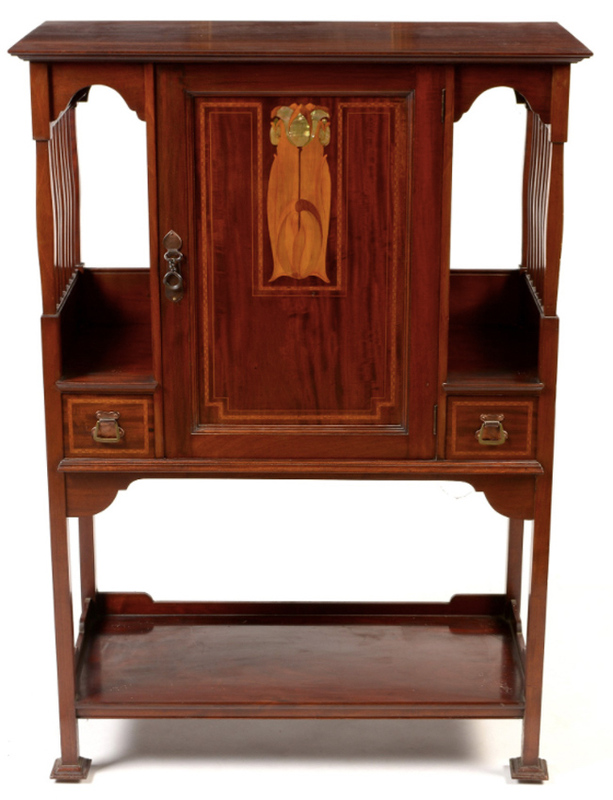 An Art Nouveau inlaid mahogany music cabinet. 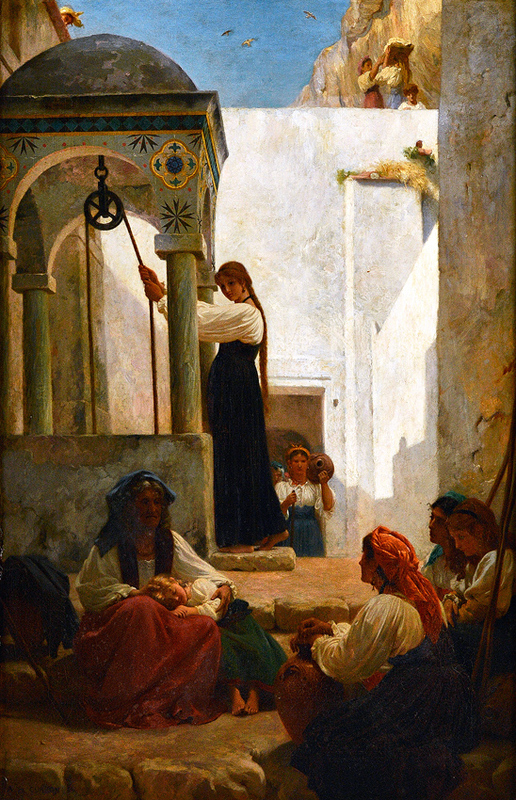 'Women at the well: Autour d'un Puits a Amalfi’ by Alfred de Curzon (1820-95). A studio collection of fresh-to-market works by the French artist Alfred de Curzon (1820-95), consigned for sale by the artist’s family, will go under the hammer at Winchester saleroom Bellmans on January 22-24. The 36-lot group comprises oils, watercolour and pencil drawings in a range of genres from landscape and portraiture to topography and religion. Included is this 3ft 3in x 2ft 1in (99 x 64cm) oil on canvas, Women at the well: Autour d'un Puits a Amalfi, which is guided at £4000-6000. De Curzon was born in in Moulinet in 1820 and began his artistic training in 1840 at the École des Beaux-Arts in Paris. Winning a bursary, he travelled to Rome six years later and began a life touring Italy and Greece. View the auction on thesaleroom.com. An American novelty silver pencil by Tiffany, modelled as the Art Deco skyscraper Met Life Tower. As part of a two-day silver offering at Woolley & Wallis of Salisbury on January 22-23 the auction house will offer the extensive pencil collection of Bond Street silver dealer Kenneth Bull. Amassed across decades and dubbed ‘The KB Collection’, it is described as one of the most comprehensive collections of its type to come onto the open market. The 464-lot collection shows the progression of pencils from the 1820s until the 1950s with most made in silver by London firm Sampson Mordan. 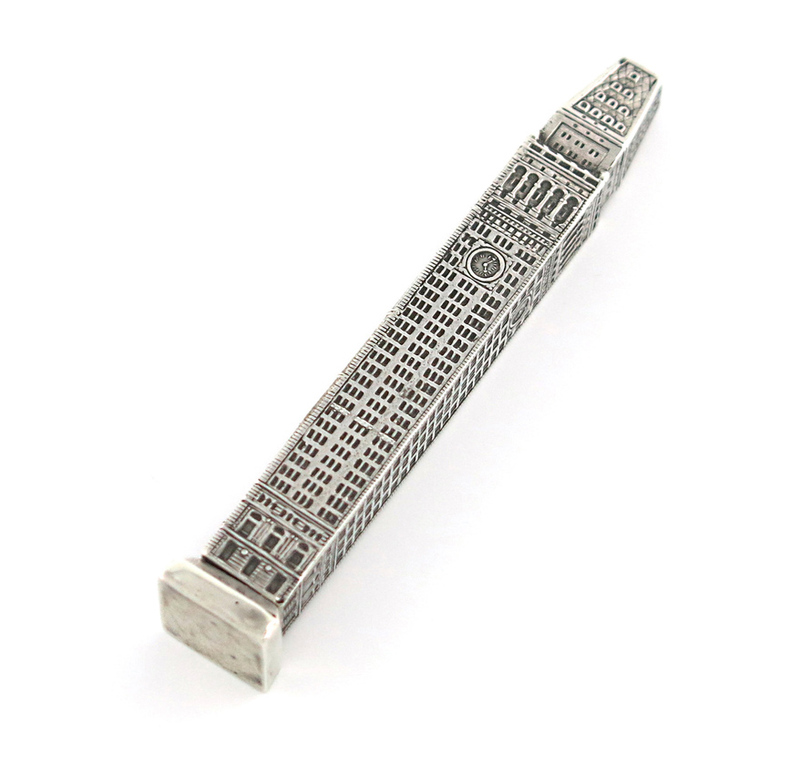 This American novelty silver pencil by Tiffany, modelled as the Art Deco skyscraper in Manhattan formally titled the Metropolitan Life Insurance Company Tower, but better known as the Met Life Tower, is guided at £1000-1500. To view the pencils and the auction visit thesaleroom.com. 'Koblenz Ehrenbreitstein und Staffendorf am Rhein' by Carl Ludwig Hofmeister. Dreweatts kicks of the New Year with a sale of three private European collections – one from Spain and two from Italy – at its Donnington Priory saleroom in Newbury on January 23. From the hills of southern Spain, an Andalusian finca is the source of around 140 lots of Continental, Jacobean and Georgian furniture, objects and works of art as well as English ceramics, silver and paintings. 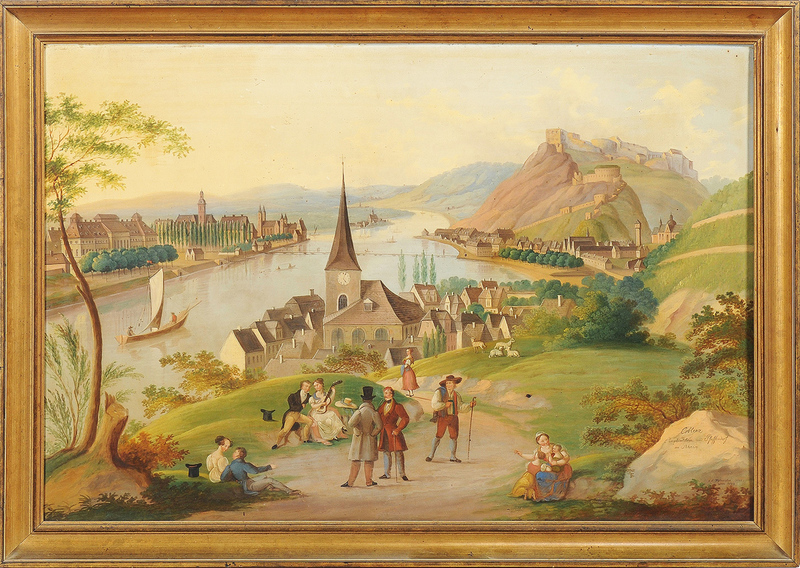 Among the items is Koblenz Ehrenbreitstein und Staffendorf am Rhein, a signed 22 x 2ft 8in (56 x 82cm) oil on copper by the Austrian painter Carl Ludwig Hofmeister (1790-1843). It is dated Wien 1828, the year in which the fortress, Ehrenbreitstein, depicted in the background of the work on the east bank of the River Rhine, was completed. It is estimated at £4000-6000. To view this lot visit thesaleroom.com. This Art Nouveau inlaid mahogany music cabinet is estimated at £250-350 in The Modern Sale on January 24 at Newcastle saleroom Anderson & Garland. Attributed to Devon furniture maker Shapland & Petter, the 2ft 11in x 4ft 3in (90cm x 1.29m) high cabinet has a rectangular top above a single door with mother of pearl and fruitwood inlay and is flanked by recesses and spindle sides with two short drawers to the centre. To view this lot visit thesaleroom.com. 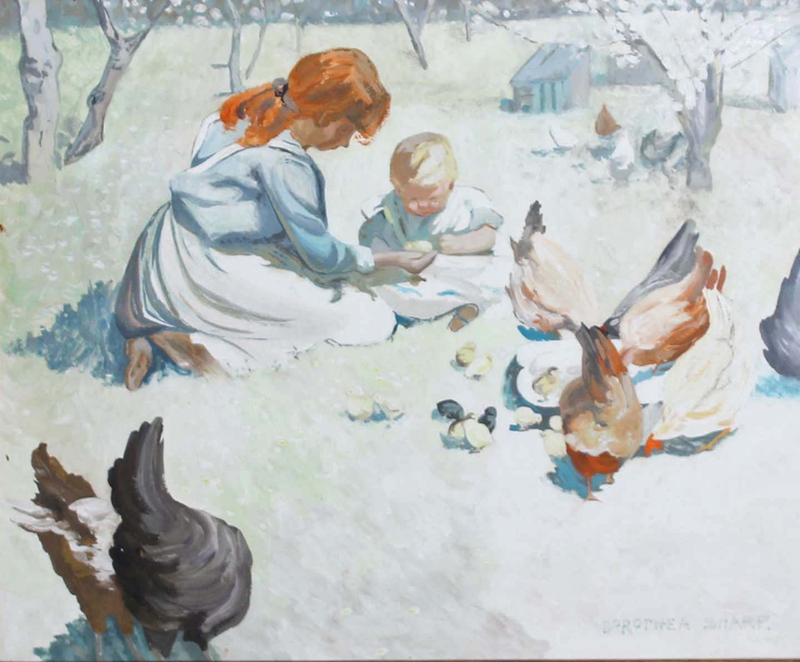 Dorothea Sharp's Feeding the Chickens. This Dorothea Sharp (1874-1955) oil on board Feeding the Chickens will be offered at Bristol Auction Rooms in Brislington on January 24. With provenance to Bentley's Fine Art, it had previously been bought directly from the artist. The 14x16in (35x41cm) picture is estimated at £8000-12,000. To view this lot and the auction visit thesaleroom.com.